Scunthorpe midfielder Matt Sparrow is hopeful he can help his hometown side to the League Two title in his 500th game with victory over York City. The Iron secured promotion last week despite Exeter ending their 28-game unbeaten run under Russ Wilcox. "I think winning the title in my 500th game would top off everything I have achieved in my career," 32-year-old Sparrow told BBC Radio Humberside. "It would be one of the proudest moments of my career without doubt." A victory for Wilcox's third-placed side would secure the title if Rochdale fail to win at Newport and Chesterfield do not beat Fleetwood. 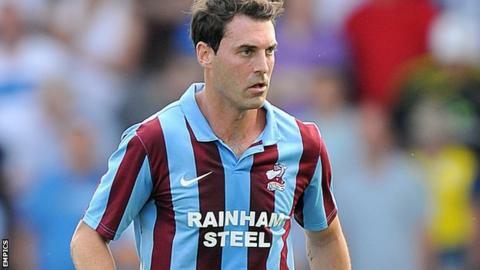 Sparrow started his career with Scunthorpe in 1999 and returned for a second spell last summer following spells with Brighton and Crawley. He has now won four promotions with Scunthorpe and spoke of his pride at reaching the landmark appearance. "To reach the milestone is a great achievement and I'm delighted to get there," he added. "To have the majority of my appearances here is a fantastic feeling. I wouldn't change anything really because I've had brilliant times here and at Brighton. It's been a great 15 years."